The Club has a number of very committed individuals, who are dedicated to improving the well-being of the disadvantaged in overseas countries, through a range of on-going projects. A number of these projects are joint initiatives with other Rotary Clubs. In 2000, the Rotary Club of Doncaster [RCD] sought to establish a steel rolling mill in East Timor to assist in the roofing recovery program following the devastating destruction of infrastructure at the retreat of Indonesians from East Timor. The Rotary Club of Melbourne [RCM] assisted with finance for the purchase of an additional purlin mill. 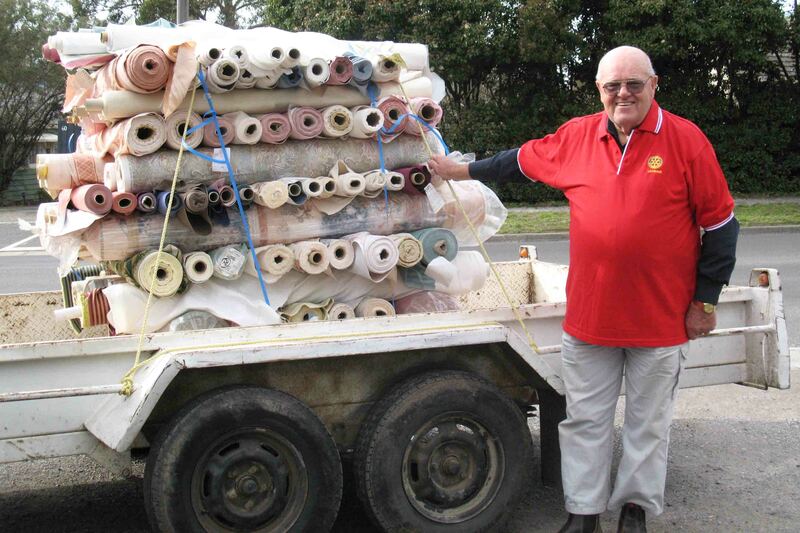 In 2001 the Rotary Club of Lilydale [RCL] became involved in the project, through club member Tim Hewitt. Our Club has contributed with financing the supply and subsequent delivery of a tray truck and equipment to East Timor. 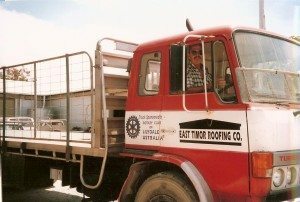 Club member Tim Hewitt and ex member Robyn Johnston actually drove the truck shown, from Lilydale Victoria to Darwin NT in 2001, for shipment to Dili East Timor and then delivery to Bacau in Northern East Timor by road. As at 2017, a total of 23 representatives from RCL [members/associated family/contacts] have visited East Timor over the past 16 years to assist with the inital set-up, maintenance/upgrade and expansion requirements of the business, as well as assisting in a number of spin-off programs, such as water drilling, health facilities, farming initatives and management systems etc. In 2005 with operations being commercially viable, a company was registered in East Timor along with a holding company being established in Australia, with RCL having a 10% shareholding with the balance split between RCD and RCM. Tim Hewitt is the RCL nominee as a Director on the Company Board of the East Timor Roofing Holding Company Ltd. The Company continues making trusses and roofing products and has now expanded into water tanks, grain silos and other folded steel products. This fledgling company has grown over the years to now have assets of over $1.8million. It employs and trains local Timorese, thus making a great contribution to the local community. In addition as required by the company’s constitution, any surplus funds must be used for the benefit of East Timor people. 2019 This successful Baucau business has been transferred to the Dom Bosco Organisation to own and manage, with Brother Adraino De Jesus holding the Management position. “Water for The Hungry Months” is a new and exciting humanitarian project to complement the efforts of the Club’s other Rotary projects in East Timor. 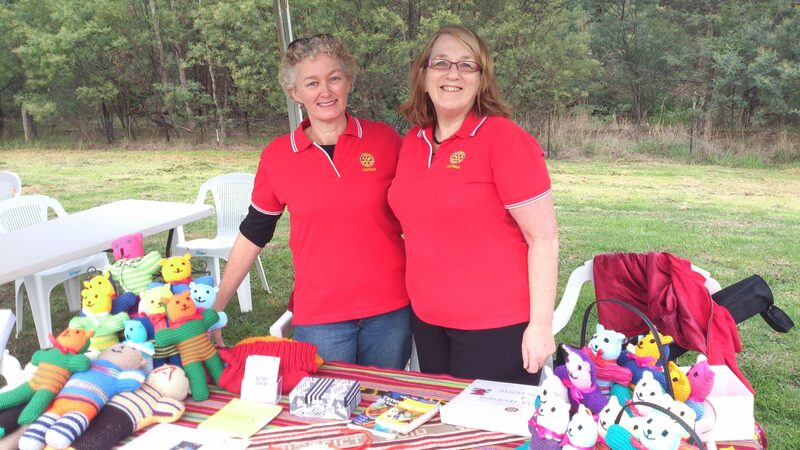 This registered RAWCS project is a joint initiative of the Rotary Club of Lilydale and the Rotary Club of Doncaster. The commencement of this project has been made possible by the existence of East Timor Roofing Company [ETR] and the funds raised through its commercial operations. 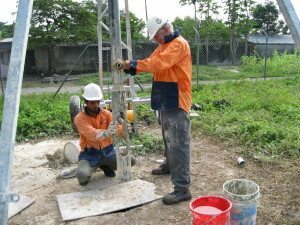 The scope of the project is to provide easier access to clean drinking water during East Timor’s dry period (April through October) via a groundwater drilling program at village level, on communal land. Donated drilling equipment has been sourced and collected from a number of areas in Victoria and then shipped to East Timor. Past President David Law and member partner Peter Sank went to East Timor to setup and commission the equipment. They found the drilling to be extremely slow and difficult to get through the very hard limestone, but had success in locating good water at 35metre depth. The wells are then capped to supply and on-going source of water for villagers. Access is via hand pumps to keep water wastage, capital and maintenance costs down. This also facilitates local effort (literally) and engenders a sense of local ownership. This RAWCS project aims to provide educated and experienced nurses (and other health care professionals) to the Clinic to assist their workload as well as providing an educational resource to staff at the Clinic. This project commenced in 2012 when two nurses, led by Jenny Selway a member of the Rotary Club of Lilydale, visited the Bairo Pite Clinic in Dili, Timor-Leste, with a fellow nurse from Maroondah Hospital Ringwood East.. Their visit time was spent investigating the needs of the clinic and ways in which ongoing help could be offered. Through continued fundraising and donations of goods, there have been several deliveries of medical and nursing supplies to the clinic. General supplies such as linen, hand wash, toys and clothes have also been sent. The project also sponsors the employment and education of a staff member at the clinic. This person is employed to work in the malnutrition room attending to unwell children. As a flow on from this Trauma Teddies, a “Teddies” knitting program was initiated by Lilydale Rotarians Rhonda Kellett and Jenny Selway . 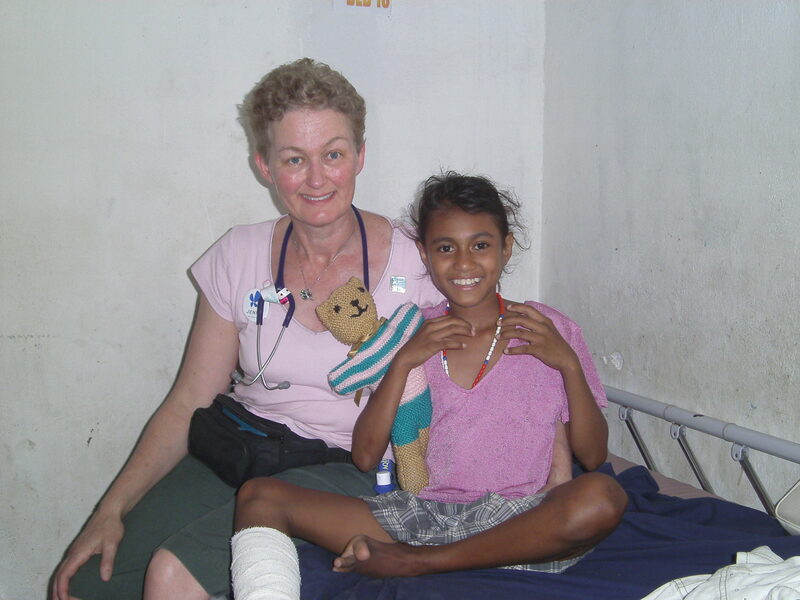 Sponsorship of a knitted teddy assists in freight costs for the transport of donated medical goods and supplies to the Clinic, as well as a Timorese child receiving the sponsored Teddy. Donations to assist in freight costs are always welcome. conducted and facilitated by President Bill Parlet and his wife and fellow club member Madalyn. WORKSHOP FACEBOOK VIDEO The following link, provides a visual overview of the workshop : https://www.facebook.com/CAPI.UNTL/videos/525652724494094/. The seminar was opened by the Chancellor with the Vice Chancellor and the Dean of the Health Science faculty present. The Graduation ceremony on the third day was conducted by the Chancellor with the Vice Chancellor present. The printing of student material and catering was undertaken by local businesses. The educational resources we took with us were accepted by the Chancellor and greatly appreciated – refer to above facebook video link for examples of resources. Funds from East Timor Roofing were used to supply these items. Student evaluation of the seminar reports that all students found the information provided to be new to them, they all believed they were able to apply the hearing assessment techniques described and practiced. They all requested more information should it be available in the future. We offered our contact details and a willingness to provide in-going support and we have so far heard from three students. The President Elect of the Rotary Club of Dili, Mr Pedro Canisio offered to act as translator for the seminar and his assistance was invaluable. The Rotary Club of Dili did ensure that we met with Ms Barbara Knight (formerly of the Rotary Club of Auckland). Barbara is now resident in Dili and privately working to improve primary school teacher’s understanding of children’s hearing. We were able to provide her with some material from the Australian Kids ears project as what she’s planning is similar. Our first meeting was with Professor do Carmo to prepare for the seminars, discuss the content, view the posters, etc. We had confirmation that 15 of the highest achieving students from Nursing and Midwifery (totally separate study programs) would be attending. Their ages ranged from 26 to 30 years old, so they were born between 1975 and 1980. Remember, it was not until November 1999 that the last Indonesian troops left Timor-Leste. We were later to discover that, while some of these students knew each other socially through church or family, they had never previously had classes in common. These students will be the first cohort from their fields to graduate in May 2018 after six years at UNTL. As children, these students would have experienced extreme disadvantage and broken access to education at best where Indonesian was taught. Knowing this history, it was very humbling to be with them; their happiness and their generosity of spirit. All midwifery students were female (7). Of the eight nurses, there was 1 female and 7 males. Their understanding of English varied but was superior to their ability to speak English. There were six students who could speak English with some confidence and limited skill. Interestingly, in comparison to these adults, we met Grade 3 students who were fluent in English. Because of Timor-Leste’s Independence, those children had exposure to compulsory schooling, English from 1st class and (of course) from television. Before the 15 participating students graduate in May 2018, they will undertake community-based research and health promotion to inform local parents about how to maintain the Hearing Health of their infants and young children. They are now planning to develop early intervention sessions to deliver to parents to teach them the importance of Hearing Health. We have offered to provide support for them to do this. As many expect not to have jobs immediately on graduation they would like to volunteer to continue to deliver these services in their communities. This generosity and commitment to their community is a fairly common strategy for young people who want to help their country advance. While at UNTL, the Chancellor expressed a keen willingness to advance the Memorandum of Understanding [MOU] with Melbourne’s La Trobe University. Dr Heine reports that she has that in progress although it will take time. Two separate three month Vocational visits have been fully funded, by the Rotary Club of Lilydale, for a UNTL Mid-Wifery Graduate [Zulmira] and a Primary School Teacher [Marcia] during July – October 2018 and October – January 2019. They have been home hosted by Club Members during this period and took part in numerous Club activities. 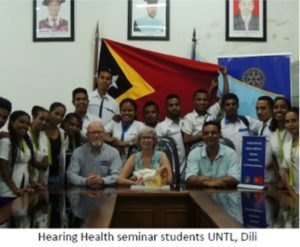 These Vocational Visits provided real opportunities to improve their English, teach them both, more about the importance of Hearing Health as well as prepare each to engage professionally on their return to their occupations in Timor Leste. During their time here, they experienced time in Eastern Health’s Maternal/Child Health Clinics, plus Audiology clinics as well as over-viewing the critical Administration role. While in the Victorian workplaces, their role was strictly as an observer. In each health service, they were offered post-graduate practicum teaching suitable for a recent graduate of UNTL by senior clinical staff. Additional time was also spent at local Early Learning Centres, which provided a real hands-on experience. 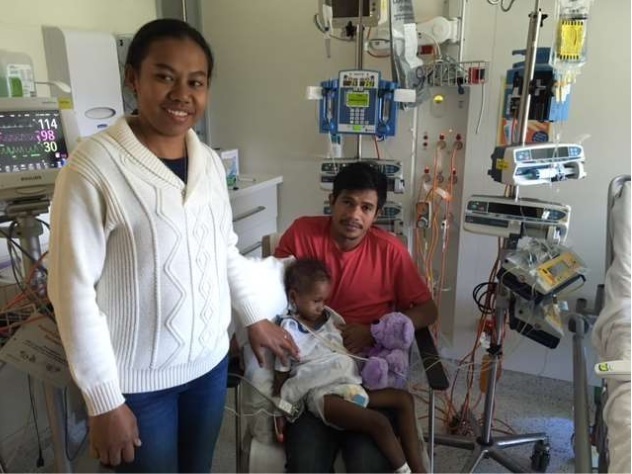 The timing of Marcia’s visit was opportune as she provided invaluable interpreting skills for a visiting East Timorese family attending Melbourne’s Royal Childrens Hospital for major surgery of their young child. 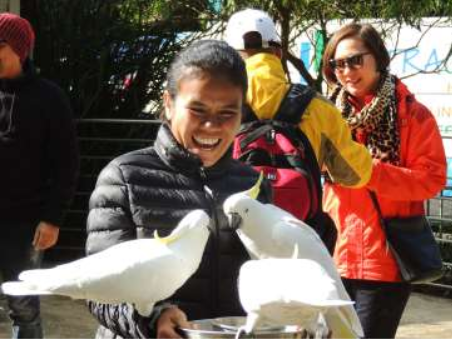 Donations in Kind is a program supported by Rotary Clubs in Australia which grew out of the compassion and concern of returning overseas volunteers. The program involves the collection, sorting, packing, dispatch and distribution of donated items to countries in need of these goods. Many goods and products, for which organizations in Australia have no further use, are valuable commodities in needy countries. While 50 computers with non-flat screen monitors and less than 1 gigabyte of memory may be obsolete for some corporate offices, they might instead be of significant value in helping the education of under privileged students in East Timorese universities or in assisting with the accountancy of micro-finance finance projects in Africa. Fabric donated by Dollar Curtains has been turning into sleeping mats, rice bags, clothing etc. Excess stationery and office supplies have been distributed throughout the Asia Pacific region and beyond. Obsolete school chairs, desks and tables have been rescued from the recycler, resulting in partnerships being established between local schools and overseas schools where the equipment finishes up. The cost to ship a container to East Timor for example is $8,000.00. Partnering Schools are being encouraged to adopt this as a fund raising project to assist with shipping costs. 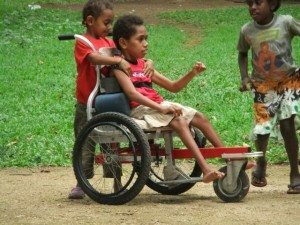 Wheelchair for Kids was initially established in Western Australia, with retiree volunteers in Australia using donations to make and distribute up to 300 wheelchairs per month to poor disabled children in developing countries. Millions are needed, but every one makes a difference. Every $150 raised gives a child the freedom of mobility and liberates a carer. Our Club has regularly contributed to the costs associated with the making of these wheelchairs as well as the associated freight/shipping costs. Every contribution / donation assists in providing a means of mobility and a much better quality of life for these children.